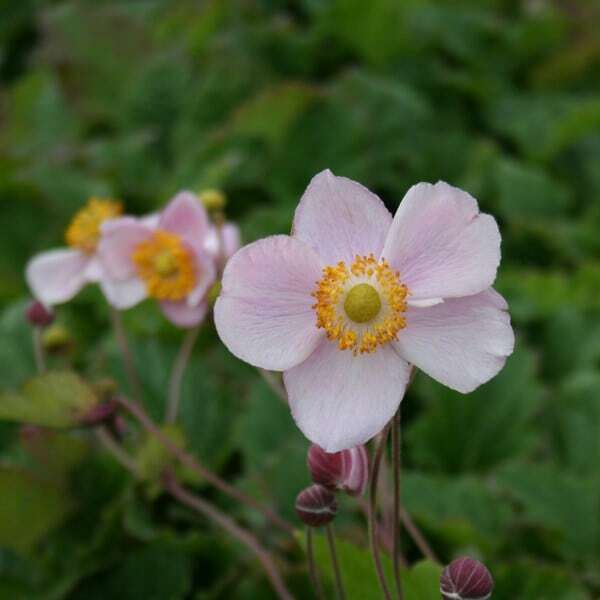 A fabulous plant for bringing colour to the garden in late summer and autumn, this anemone has masses of large, rosy pink, cup-shaped flowers on tall, wiry stems from July to September. One of the most reliable and free-flowering of the Japanese anemones, these have distinctive purple-tinted stems and outer petals, which contrast beautifully with the pale pink inner petals. The leaves are pretty, too – vine-like, dark green, and semi-evergreen. They are perfect for areas of partial shade towards the back of a moist herbaceous or mixed border. Garden care: Cut back the stalks after the flowers have faded. Tidy up old dead leaves in March. Apply a generous 5-7cm mulch of well-rotted garden compost or manure around the base of the plant in spring. Avoid moving the plant since it resents disturbance. Where necessary lift and divide congested clumps in early spring. Is happy in a shady corner and gives good colour in the autumn. I added this to my front border and the delicate flowers appeared when my other plants were fading. A great addition to the garden. These take a while to get established, and they need adequate water (something to bear in mind with these long hot summers) but once it gets going it's hard to beat. The pink is SO beauteous with all the summer hues and personally I prefer it massively to the double ones, which just don't have the same charm. Five stars. Bought this as small plant in 2 litre pot- kept it in its pot until well-rooted as it hates root disturbance. It has been so slow to establish- I thought it will not grow any bigger, but this year has put on a bit of growth, more stems with leaves, but no flowers. I will plant in ground next spring and hopefully will romp away. Nevertheless, a beautiful autumn-flowering plant- can't wait to see it in its full glory when its more mature. how do i recognise the japanese anemone i planted last year before it flowers? How big should the plant be and what will it look like? Hello, These plants die back completely in winter, and as they tend to flower from mid- to late summer, they often tend to be late into leaf too. When it does start to emerge, you will see a mound of foliage, which is lobed and toothed. Hello, I'm new to growing Japanese Anemone and was wondering after the flowers have faded, how far back the stalks should be cut for optimal regrowth next season? Thank you! The Anemonies are fully hardy and have been grown in their pots, so they can be planted out at any time of year as long as the soil isn't frozen solid. As we have had such bad weather The Anemonies are fully hardy and have been grown in their pots, so they can be planted out at any time of year as long as the soil isn't frozen solid. As we have had such bad weather though I would hold off on planting them until the weather warms up. In the meantime the plants can be kept outside against a warm, sunny, sheltered wall until you are ready to plant. Thanks for sending the Japanese Anemones, which we received yesterday. We have a query about the timing of planting, and how to store them, given the current weather. We live in Farnham, Surrey where the temperature is currently maxing it 5-6 degrees C during the day, but dips to -1 or -2 at night. Could you confirm if we should plant them out now, or wait until the temperature is above freezing at night?